Imagine working with a web design, development, programming, marketing and SEO company that wants to really understand your business and use its online presence to help you win significantly more visitors and sales. A company that has the experience of creating over 1,000 websites but still has the enthusiasm to make its next project the best yet. A company that helps you wage a war with Google that enables your site to climb to the top for your key search phrases. We don’t just build websites – we build businesses. Want to find out how? This website will show you how our team have helped companies like yours to succeed and grow online. Why not give us a call to find out what we could do for your business? To find out how we can help you grow your business, whether you are an established company or a new online business startup, contact us today on 01604 638421. Freetimers Internet is a top UK specialist in web design, website programming, database and web development, search engine optimisation (SEO), web marketing, content management and ecommerce. We help businesses of all sizes by developing innovative, effective websites on the one hand, and internet strategies, web marketing and search engine optimisation solutions on the other. Freetimers works as your partner on the Internet, with an implicit understanding that our success is related to your success, and that helping you build your business is our first priority. To find out how we can help you grow your business, contact us today on 01604 638421. Our business really is about helping you build yours, and using our IT systems, business management and Internet expertise to help you maximise your business' potential. We will help you get to the top of your field on the Internet, with a great website that will achieve your business goals and build for the future. Many of our most successful clients were start-ups just a few years ago, and some of these have indeed reached the top, and we are still working with them, every day, with new marketing and SEO campaigns, new website functionality, and programming to make them highly efficient by automating their back office processes and integrating them with their websites, to ensure they stay ahead of their competitors. Freetimers is not just a web designer, developer, programmer or SEO specialist. We are a web strategic partner for your business, and we honestly believe there is no one better than us. We have proven beyond doubt that working in longer term partnership with our clients, and keeping everyone engaged with the website and the overall Internet presence, are the major factors in web success. So if you have been through the mill with other web firms, or are a new startup yourself, make the right decision and choose Freetimers. We design ecommerce websites that really sell, and then we continuously improve them so they simplify your business processes and enhance your service delivery. Better sales, better quality, more efficient customer service, better profitability and happier customers. Freetimers has been designing and developing ecommerce websites since 1998, so we have more than just a little experience in this area. The ecommerce websites we regularly develop are also able to deal with complex product and service offerings which most developers shy away from. As a result, our clients’ websites are able to out-perform their competitors, both in the public visible part of the site, but also in the back-end management system, which can be more easily customised to suit the specific needs of each business, without forcing them into the restrictions imposed by using an off the shelf system. If you also trade across multiple channels, our flexible multi-channel system could be the solution you need. If you have a new, complex or more serious than usual ecommerce project in mind, or you are looking for the internet strategic partner that has been missing for your business, then you should be talking to us. Contact our Managing Director Greg Poulson, on 01604-626477 to discuss your requirements. Online Process & Workflow Streamlining Integrate your business processes with your website to improve profit and customer service. Freetimers’ real business management and systems design/development expertise can help you improve and automate your business processes and deliver massive efficiencies to your operations. If your business actively trades online, or has a complex service delivery that uses the internet extensively, then you will know that competition doesn’t only relate to product pricing and a slick website, but to how highly integrated, efficient and effective service delivery and management systems are comparatively. On the internet today where ecommerce is at its most fierce, the best prices often are the best because the operational and quality costs are lower than their competitors’. Certainly at Freetimers, we see this every day, and we actively work with our clients to help them optimise the structure of their operations to make the fullest use of the potential efficiencies available from the internet and business process automation/streamlining. In part, our most successful clients are those that see the importance of this, and we work with their owners and directors every day. Unlike most web design and development, creative and digital agencies, Freetimers’ directors have substantial business and entreprenuerial experience covering most business disciplines and a number of sectors, and we readily contribute this knowledge to the benefit of our clients, making great savings whilst also improving their capacity to compete. For an initial free of charge discussion of your on-going requirement telephone our managing director Greg Poulson on 01604-626477. Complex Programming, Apps & On-Going Dev Advanced web programming and on-going development that others can't handle? As a first generation web development company starting in 1997, unlike many web designers and digital agencies these days, Freetimers is a ‘proper’ developer and web programming business, ie we do the complex programming that others shy away from. Basically, if it is web oriented, and possible to program, we can do it, and in many cases, we already have. Freetimers built its first dynamic database-driven ecommerce website, from scratch, in 1998, and we developed our own multi-modular website management and CMS system by 2000, several years ahead of many of today’s open source platforms such as WordPress, Magento, Joomla, OsCommerce or Drupal, which most web designers now depend on. One of our developers created the first version of Captcha form protection, that was actually adopted by the W3C. Today we still develop new web software solutions every day, including some of the most sophisticated website systems online. An important part of our business is also working with our clients to progressively improve their service through on-going programming and automation of their business process, all linked directly with their websites. Our forte is therefore not just to build good websites and to help our clients to compete, but to help them continuously to become better at competing, making it more and more difficult for their competition to keep pace, and to eventually put them in an un-assailable position. If your business needs advanced programming, mobile apps development, or a business targeted programming expert by your side, you should be talking to Freetimers. Contact our MD Greg Poulson on 01604-626477 for an informal chat about your requirements, and you’ll see we mean business. Back Office & Multi-Channel Integration Improve your ability to compete by integrating back office and channel systems with your web system. Having an efficient integrated ecommerce operation can be a key factor for any company wishing to compete effectively in today’s fiercely competitive internet environment. What many companies struggle with is a multitude of online website and other channel management and inventory systems which are not integrated with each other, nor are they integrated with a central inventory, financial and MIS system. Another issue with most off the shelf ecommerce systems, is that even if they purport to provide a multi-channel solution, they rarely do, and usually require the same prices, photos and descriptions to be used for each channel, taking no account of the different market characteristics each channel presents. Freetimers are experts at assisting companies to take these big steps and making integration, with flexibility, possible. Further still, we help you do this in the way that’s right for you and your business, and not force you unnecessarily into the straight jacket of an off the shelf system. In fact our experience shows that standard packages can hinder a company’s progression, because in using their system the user has to organise their company somebody else’s way, and worse, the same way that many of their competitors might be doing it. Instead we work with our clients to help them explore the possibilities and find the best solution and the one that is right for them, ranging from pure bespoke solutions to combined bespoke and package solutions. We also develop multi-channel integrations with websites, Google Base, Ebay, Amazon and other 3rd party platforms, to maximise your business efficiency, whilst simultaneously maximising your channel by channel flexibility, management and servicing in terms of independence of pricing, product descriptions and packaging, and service delivery. To discuss your requirements contact us today on 01604-638421. Online Startups & Major Web Projects Big idea for an online business? We can help bring your project to life. Freetimers has an enviable track record of online business startup successes, that we believe should give you confidence that you will not find a better web development partner to help you take your project forward to launch and a successful future. One of the most important contributions we can make is that we don’t confine ourselves to just thinking about the design of your site and its subsequent marketing. In fact we take a business-centred view of your future website, and work with you as a sounding board, confidante, and knowledgable advisor on the business model, its organisation and the business processes behind the site that will enable it to seamlessly achieve its goals. What is certain is that a new online business is not just about pretty pictures and a logo, and the typical design agency really can’t contribute much beyond this. We’re very different! Look at some examples of our startup successes. Boomerang approached us with a startup idea for an online video game rental service in 2006. Initially we helped the client to determine what should be included in Phase 1 that would be sufficient to prove principle, but also within a budget the new business could afford. The business and the launch proved successful, and it won WebUser Magazine’s Best Website award in 2010. Now in 2013 Boomerang continues to grow and improve its service, with probably the most sophisticated online management system in the sector. We recently completed Development Phase 29 and throughout the life of the business we have steered the website through a myriad of hosting solutions, now with a fully dedicated and PCI compliant server system with multiple automatic data and file backups. Freetimers also undertakes all the SEO for the site, which presently ranks in the top 3 of Google for some 80% of its search phrases against huge competition, including businesses with very deep pockets like LoveFilm, Blockbuster and Tesco Direct. In addition to being No1 on Google for ‘games rental’ for several years, for an idea as to scale, in September 2012, of the 371 search phrases we actively monitor, Boomerang had 208 No 1 positions on Google, all of its most important 10 phrases in the top 5 (8 of 10 at No 1), and 82% of all the phrases in Google’s top 10 results. To find out more, see our Boomerang article in our Featured Sites portfolio. Simply Education came to Freetimers as a start up idea in 2005, as a new recruitment business focusing entirely on the supply teaching market. The main USP was to be that the business would be highly efficient from the start, all driven by an online administration system Freetimers would create, and automating just about everything that could be automated. Freetimers designed and launched the initial site very successfully, and has worked with the client constantly throughout its lifetime, continuing today. Freetimers has managed the hosting of the site to a dedicated solution, and the business now boasts over 30 staff using the system we created all day, every day. We also do all the site’s SEO (search engine optimisation) and undertake new complex web development work, every month. The business is now very successful, with a £multi-million turnover, and also had attracted investment from James Caan of Dragons Den fame. To find out more, see our more detailed portfolio article. These are just two of our successful start-ups of many, and we’d very much like to have a chance to help you with your startup idea. Contact Freetimers today on 01604-638421 and ensure your new venture has the best chance for success. SEO & Web Marketing Our SEO service consistently achieves first rate UK & Sector leading results on Google. Being found on Google for the most important search phrases for your business, either using SEO or Google Adwords, or both, can be the key to online success. Freetimers are SEO experts, and we have an enviable and verifiable track record to prove it (Please see our SEO Case Studies, of real, true results, and we’re sure you will agree). We are an expert company at SEO, not just 1 or 2 individuals freelancing SEO. By contrast we have been providing a wide range of clients professional SEO services since before Google started; we have watched the evolution of the internet and SEO, and been involved at the very heart of it since 1997. We have significant experience in just about every sector and can deliver first rate results for local, regional, UK, and international campaigns. But what makes us really stand out is that we dedicate ourselves to a single client per sector and competing locale. We work as a committed, interested and proactive partner to help you grow your business. As you grow we grow with you, and we have been operating this principle very successfully for the last 10 years. We work with you on a continuous improvement basis that covers, ultimately, anything that is needed to help your business grow, including on-site and off-site SEO, web marketing, pay per click/ Google Adwords, conversion rate optimisation, current referring content creation and management, social media marketing, dynamic product, location, ppc and seo landing page creation. 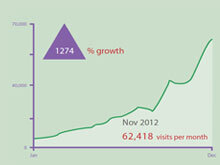 Our best result so far is an 8,900% visitor rate improvement over 6 years for one of our clients. To find out more about our SEO service contact us today for a free of charge initial discussion of your business and its goals. Phone us on 01604-638421. Reliability since 1997 – 16 years in the field, We won’t disappear on you! Vast Experience – We’ve designed and developed 1000+ websites, covering every sector, and from small sites to massive sector-leading ecommerce sites. If it can be done, we can do it. Real Business Knowledge. We’re not just designers, programmers or sales people. Our principals have extensive transferable business knowledge and experience that has been proven to add value for clients. High Quality Code – We do advanced bespoke web programming and do not have to rely upon open source pre-programmed applications, ecommerce and CMS like many web companies. Instead we have the direct skills and experience of major system development and undertaking customisation and expansion of web systems that many others can’t handle. Brendan Fearn, MD Flix Innovations We had an excellent service from Greg and the team. They quickly understood our needs, advised us on the best web strategies, and then delivered a super-quality product on time. Would recommend very highly.